What’s it about? Don’t let the air-headed appearance fool you—Karen Aijo may have trouble getting up in the morning, but she’s still the top student at Seisho Music Academy, a girls’ performing school with a 99-year history. When she was a little girl, she attended a performance of the Starlight Revue with her best friend, Hikari Kagura, and decided she wanted to join that world. Hikari left to study abroad in England, but now she’s back. The night of her return, Karen has a strange dream of Tokyo Tower and a battle onstage. I grew up in the theater. I was born in Hollywood, and my father is a semi-professional actor. I was on national TV before my first birthday and played with my sister on the stage of one the oldest playhouses in L.A. I eventually chose a different path, but along the way I helped design sets, played violin in the pit, assisted with costumes, and wore black as part of the stage crew. Japan has a different theater culture, particularly with the Takarazuka Revue system that Revue Starlight cribs from, but stories about the agony and ecstasy of performing onstage always has the pinch of familiarity to me. To this day, I wonder if I missed a calling as a comedic actress. An only slightly exaggerated depiction of my upbringing. Theater is a harsh world. Hard work and talent are essential, but without the right connections and the right genetics, they could end up meaningless. Voice actress and director Stephanie Sheh once remarked at a convention panel that part of the reason she got into voice work was because casting directors don’t know what to do with a four-foot-ten Asian woman. It’s full of contradictions. There are more female actors than male, but the vast majority of roles are for men. Your fellow cast members are cherished collaborators for the months it takes for the production to come together, but the moment you’re back to auditions, every single one is your rival. 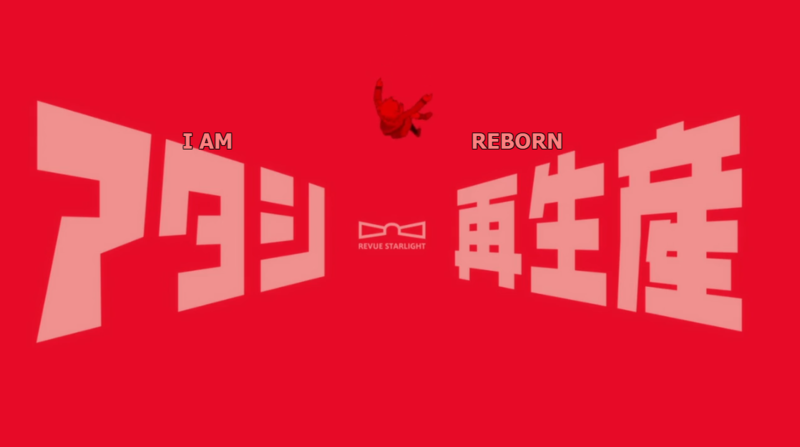 The first half of the first episode of Revue Starlight focuses more on the camaraderie and hard work part of the equation. The comparison I saw most around my sphere of Anitwitter was Love Live and, though I admit I’m not well-versed in the world of idol anime, the comparison seems apt enough. They throw a good dozen or so cute girls at us, each with sufficiently exaggerated personality traits to make them distinctive and memorable. Karen is a standard sort of heroine, spacey and excitable with a best friend to babysit her, but instead of the mediocre audience stand-in just doing her best, she does appear to have genuine talent. Some of the girls are goofy, some are more intense, and all of them are working together to put on a performance of the same play each year of high school, with greater levels of professionalism each year. Karen is just thrilled to be performing Starlight, the play that ignited her love of theater. But then Hikari arrives, Karen falls asleep, and it turns into a surreal dreamscape of Tokyo Tower, transformation sequences, and elaborate stage fights. Oh, and a giraffe is there. Director Tomohiro Furukawa is a protege of Kunihiko Ikuhara and worked extensively on both Mawaru Penguindrum and Yurikuma Arashi. That experience shines through in the second half of the episode, which is steeped in symbolism and surreal imagery. Hikari’s arrival is somewhere between Homura in Madoka Magica and Rin from Free: a childhood friend, long departed, arrives from training in another country, acting distant and heralding strange events. It’s too early to know what exactly the imagery means, but my best guess is the inherently competitive nature of auditions and how each one is a battle for a part. Auditions can literally make the difference between eating and not eating for actors, let alone breakout roles that could lead to fame and fortune. This is further foreshadowed by the characters discussing who will get the lead roles in Starlight this year. Symbolic battles are a great way to depict the make-or-break competition between friends, dramatic and internal, without dipping into melodrama. Most performance-based anime these days are based in the idol industry, which focus more on the camaraderie of the group. For decades, the series that took the most advantage of the inherent drama of the theatrical setting has been Glass Mask, which has been running for 40 years. Glass Mask, however, has the melodramatic sensibilities of its 1970s origins and tends to go a bit overboard. In its first episode, Revue Starligt has potential to take a more balanced look. While it’s still too early to know exactly where this series is going with its two worlds and characters (or if the yuri overtones will lead to anything substantial), if you’re a fan of shows about performances, surreal series in the vein of Ikuhara’s works, or both, give this one a try. You’re unlikely to be disappointed.